I keep getting emails asking me to renew this blog (which I’ve ignored) and it’s going to expire in like a week, prompting me to want to end it with reasonable last post. Life however, has gone on and I’ve found other hobbies to fill the hole in my life. The whole thing I can say I truly regret is the distance that formed between me and the friends I made through Yugioh and Magic. It’s been pretty sad and awkward as I struggle to find other common ground to talk about. Regardless, I’m still happy. I didn’t sell any of my decks and plan to keep them all for memory’s sake at least until I can no longer do so. Also if the opportunity to play Goat format Yugioh or EDH ever comes up, I’d still gladly accept it. This post is a final summary to close this blog. 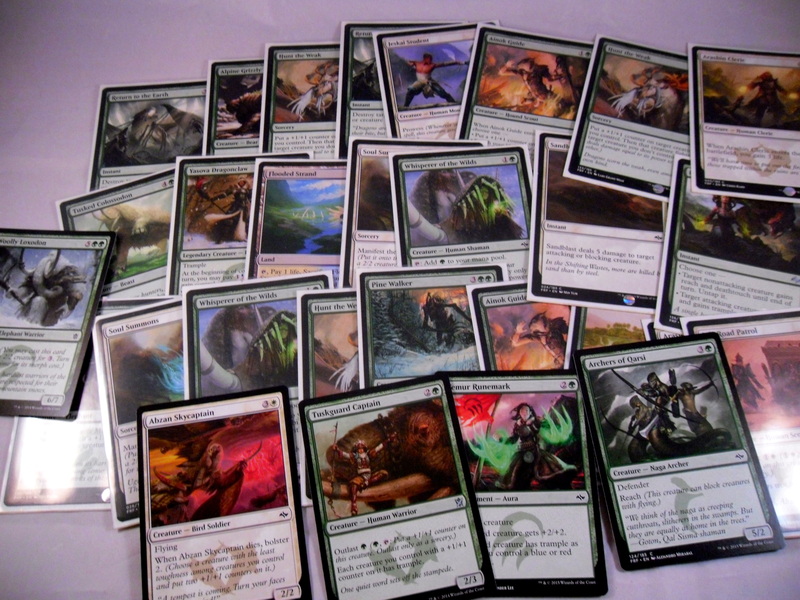 So after lamenting not playing tri-color enough I still wound up playing Green/White Ramp. My 1st pack 1st pick was Yasova Dragonclaw and then I was passed Sandblast. I told myself I was playing Abzan, but then I didn’t take any black. The basic logic I was going for was that Whisperer of the Woods combined with 4 Power creatures like Yasova and Alpine Grizzly would let me ramp up to Tusked Collosodon, Wooly Loxodon and Pine Elemental. Things didn’t go perfectly, but it was far from my worst draft deck (especially with 2 packs from a small set thrown in). As if by some weird joke I wound up playing against the same friend who convinced me to come to this event in the first place. Game 1: So he built his deck around the card Mastery of the Unseen. While I established a board of huge creatures he held his mana to keep manifesting the top card of his deck. However, since I didn’t have trample he kept manifesting 2/2’s to block my huge creatures stalling the game. Though things went south for him though when his constant manifesting not only caused him to lose his 1 out (Crux of Fate), but also destroyed his deck. I won by decking him out as Tasigur, the Golden Fang and Typhoid Rats couldn’t get near wiping out my huge creatures/life total in time. Game 2: He mulligan-ed to 2. I don’t think I need to say anymore (granted I still managed to cast Crux of Fate on curb somehow). I played against the Sultai player from earlier. His deck was more or less pump flyers the deck. Game 1: Alabaster Kirin enchanted with a Mardu Runemark put me on a clock I could not keep up with. Game 2: OK so I committed the sin of keeping a 1 land opening hand. I had Whisper, Yasova and multiple 2-3 mana cost spells. I rolled to decide on the mulligan and didn’t mull. Luckily, I pulled a land on turn 3 and managed to establish an un-crackable board thanks to a bolstered Whisperer of the Woods, which lead to 6/4 Yasova. I was able to game him with Ruthless Instincts. Game 3: I tried hard to stabilize despite a mana screw the entire game. However, even with much struggling and almost going into time I lost at the last second. I should point out that Gurmaw Angler was once again the death of me. I faced off against the Blue/Black Control player from earlier. This time he was running multiple Gurmaw Anglers and Pilgrim of the Fires. Game 1: Gurmaw and Pilgrim crushed me despite my Abzan Skycaptain getting him down to 9. Game 2: I sided as best I could to oppose his huge creatures. Luckily, Hunt the Weak dealt with his Pilgrim allowing me to overpower him. Game 3: I’ll assume he got color screwed or something since I was able to control the flow of game 3 completely beating me with limited resistance. So I went 2-1 with this deck, pulling a Flooded Strand in the process. I was very happy after the draft (as it helped soften the blow of losing in the main event). I’m getting more confident in my draft skills which is why I’m torn between actually making a competitive standard/modern deck or just continuing to draft. I’ll make a future plans post sometime later or tomorrow. I want to evolve in both Yugioh and in Magic (play competitively). I’m not sure where to go and I’m very torn as to what decks to build. However 2 AM is probably a bad time to mull it over so I’ll figure things out later. Thanks for reading about my 1st PPTQ and first full day of Magic in a long time. 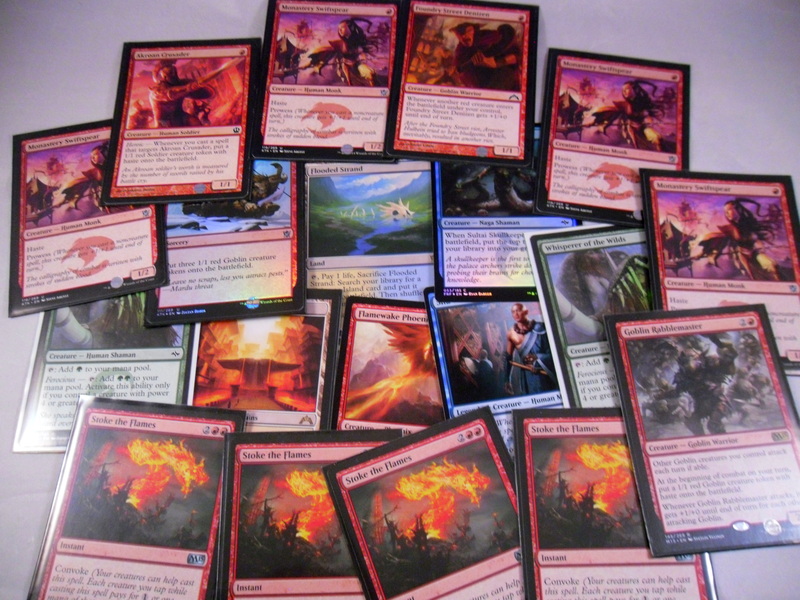 So the 2nd thing I wanted to use this blog for was to discuss my Friday Night Magic drafts. 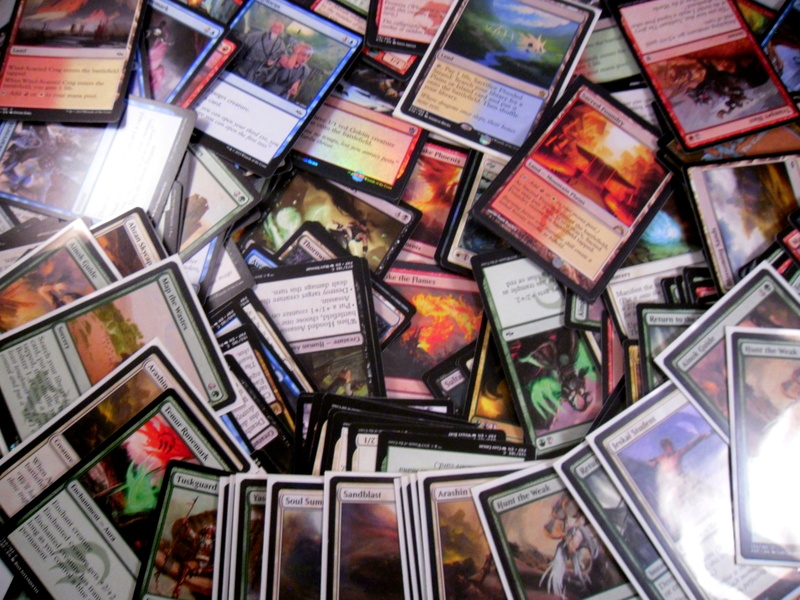 I try to head out to FNM as often as possible and then post about my match-ups, pulls, etc. This is my first attempt to do so in a blog post so here goes. 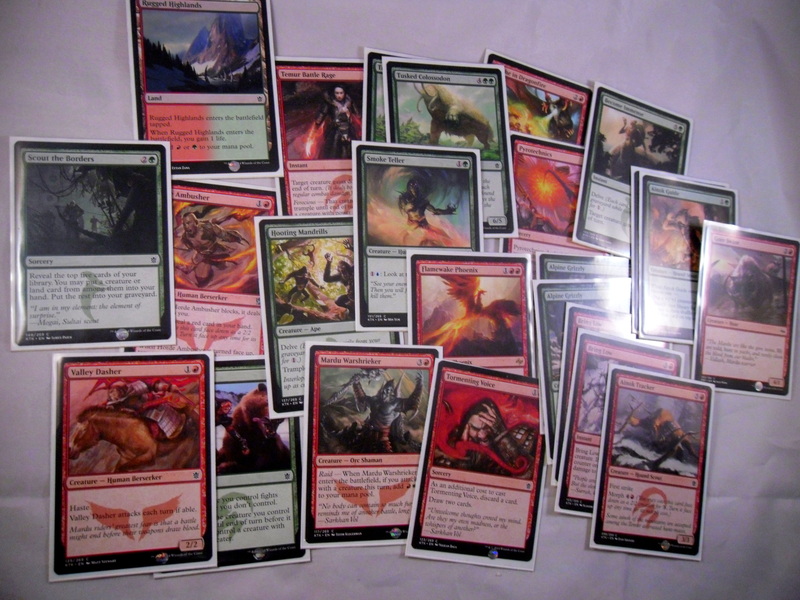 So I played Red/Green Aggro (also known as Gruul also known as Temur without the shaman part). My 1st pack first pick was Flamewake Phoenix so I immediately tried to go Temur to abuse it’s Ferocious Effect. 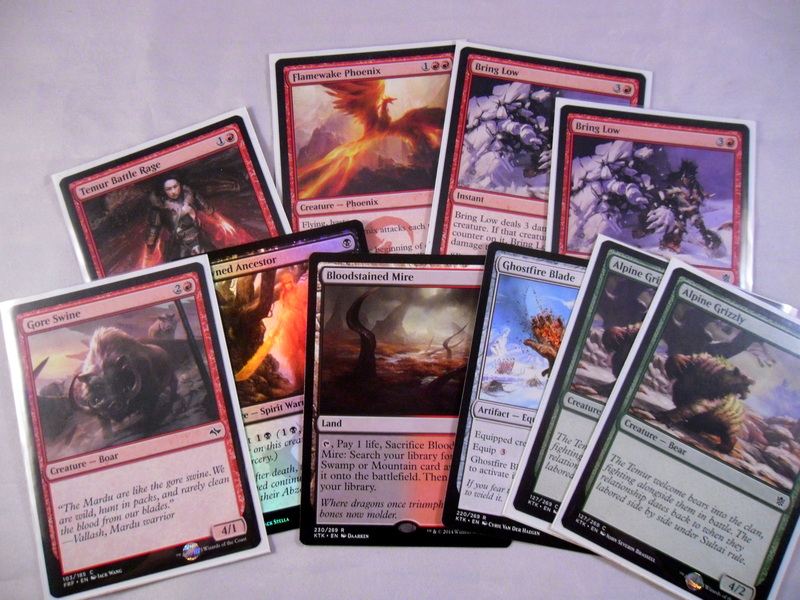 However, I think my resistance to playing 3-color got the better of me again (See Fate Reforged Pre-release, which someday I’ll reminisce about) as I didn’t start taking blue cards until pack 3 (and they became essentially pointless). My basic game plan was to out-speed my opponent with cheap Red creatures and use Tusked Colossodon for the late game. From the lack of excitement in my wording you can probably tell things didn’t go as I planned. I played against my high school rival (literally a high schooler I keep getting matched up against) who was running a very flavorful Mardu deck. He had Ankle Shanker, Despise and even 2 Ponyback Brigades at his disposal. His deck almost looked like the Mardu intro pack. Game 1 I lost after getting turn 1 Despised, though the needle in my coffin was forgetting to play my Hooting Madrills the turn I could’ve dropped it thanks to Delve. I was then wrecked by warrior rush. Game 2 I got Flamewake Phoenix on curb (words that tend to accompany my success) and I beat him with minimal resistance. Game 3 he made a very bad play using Rush of Battle (words that should never be said) and it allowed me to win the match. This was where things fell apart for me. I was playing a friend of mine who was drafting next to me. I knew he had opened and was running Warden of the 1st Tree (which contrary to a certain someone’s opinion turned out to be a major threat). Game 1 was close with us both at 5 or less life when he beat me. The Arashin Cleric and 1/1 Bird Soldier held off my Flamewake Phoenix and Valley Dasher long enough for him to beat me. Game 2 was another close 5 or less life finish. I sided in my 2nd Tusked Colossodon in hopes of overpowering him, but it just didn’t come in time. I was playing a little kid who very blatantly told me before the game he pulled Sarkhan. Despite my initial fear his inexperience with the game lead to his downfall. Game 1 he had game on me, but didn’t combo his Temur Battle Rage with my Alpine Grizzly (which he stole using Act of Treason). Had he done that he would’ve gamed me that turn. Game 2 I won handily with Flamewake. Somehow I took 3rd place with my record. They ran out of Fate Reforged so I took a Khans pack. Luckily, I pulled a Bloodstained Mire, which saved me from totally failing to pay for the night. I need to get back into the feel of the set and play tri-color again. Overall it wasn’t a bad night. Between decent trades, pulling a fetch and getting some more draft experience I can’t complain. Clearly all of this is fate for me choosing Bring Low over my former draft favorite Kill Shot. Depending on the snowstorm tomorrow I may have a lot to post about. Until then thanks for dropping by.